Premium Luxury Pillow. This is the lightest weight cotton available on the market that is down proof. The end result is a seemingly weightless comfort. The ultimate in luxury. German Batiste Fabric (350TC 100-percent Cotton) is filled with 850 Fill Power Siberian White Goose Down. Double stitched edge piping ensures strength and durability for years to come. I actually returned this pillow, but I still think it is 5-star worthy. The reason I returned it is because I require a medium-firm pillow and this one is medium so it's a little too soft for me. I'm a back and side sleeper so you may want to consider that too, because something this soft engulfs my head. Also, fill power is not a good indicator of firmness. So do not mistake 850 fill power for a firmer pillow. Also Interestingly, there is a tag on this pillow that says the contents are at least 90% goose down. I am not sure if there is some kind of industry standard, but that disclaimer is there nonetheless. The product is made in the USA though the fabric comes from Germany. Overall this pillow is soft and fabric covering is light and decent quality representing a good value. I'd keep it if only it was firmer. 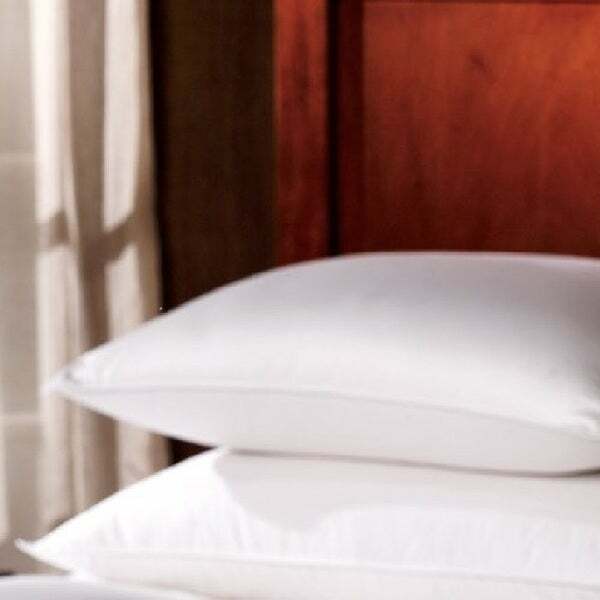 This Bedding Premium Luxury German Batiste Siberian Goose Down Pillow is really nice quality. It is soft, yet firm. I would definitely recommend. My favorite pillow. So soft it’s ridiculous. It’s not the most firm pillow but the loft is where the quality is. Expensive but I would recommend. This is a great pillow - a little pricey but worth it. Pillow doesn't go flat or have a bad odor that some down products have. Would recommend. Very fluffy and very light. Perfect! I have had other pillows that have big heavy feathers that poke through and get you but this is the ultimate in luxury! Amazing. Like sleeping on a cloud. I’ve waited years to replace my previous goose downs I had 10 yrs ago due to the expense. I never should have waited. If you like a true goose down that is “squishy” but then shapes right back up this one is for you. So full of down! Definitely medium to firm, which is such a welcome change from the softer, underfilled pillows I have purchased in the past. Excellent quality. The label states 90% down, so I looked at the labels from 4 other down pillows I have purchased in the past, including big designer and high-end down company names. They all said 75% down, which I had never noticed before! These are exceptional, and I'm thrilled with them! The pillows so far have kept their shape. They are quite soft but I am disappointed in the feel of them. I will have to wait to see how they age before I can give an accurate review. This pillow is high quality and very lofty I love it. I bring it everywhere. Best pillow ever. The feathers do not come out and it is easy to wash and dry. It's very soft and fluffy, holds up after a night and doesn't smell. I'm comfortable all night. this pillow sits about 10 inches high. I had to force it down. some people might like this I do not. it is soft to the touch. my head did not sink in to it. instead my head stayed propped up. it is quality made. "this price is for 1 or 2 pillows?" It was 100% goose down with 850 fill power. "What is the thread count? Are there any feathers?" The thread count on these pillows is 350. The fabric is German Batiste - this is the lightest weight fabric that is still down proof. It allows for maximum comfort and loft but without the weight. This is truly a premium product. The down is a white goose down 850 fill power.. As with any down, there is no such thing as 100% down. Any listings that say this are not factual. You can never truly separate the feathers from the down. However, its not feathers with thick plumes like you would see in a feather pillow insert. They are very tiny and you would not be able to tell that they are there unless you are trained in down identification. This down is 90% down clusters (white goose down). This is hands down the most amazing pillow I have ever slept on. "What do you love about this pillow?" "1) Are these 100% white goose down (no feathers)? 2) Where/what country is down from? 3) Where/what country are these made? 4) Cover is OKEO certified - is down hypoallergenic?" most of all your questions are answered in the description. read. and if not why you expect a user to know? you're not buying the pillow anyway so what's the point. Lou A., no answer would have been better than submitting such a rude response.